The wife and I recently did a one night staycation downtown Detroit for my birthday. We stayed at the Aloft Detroit which is located in the old David Whitney Building. This building is beautiful and the lobby is stunning. It is also in a prime location only blocks away from the stadiums and a stop on the Q-Line is just outside the front door. The David Whitney Building was built in 1915 and it was re-purposed into a hotel and apartments in 2013, with the work completed in 2014. The Aloft Detroit is a category 4 SPG hotel which costs 10,000 Starpoints per night (or 30,000 Marriott Rewards points). The cash rate usually hovers in the $250-$350 range. This hotel will almost always net you at least 2 cents point. You could currently get 3 nights here with the Chase Marriott card’s increased 100,000 point sign up bonus. CLICK HERE to compare this and other hotel rewards cards. 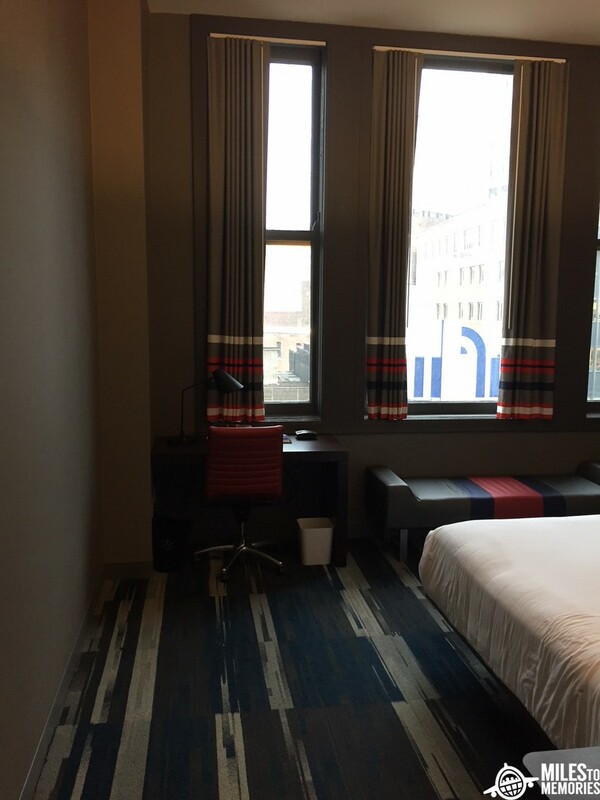 The Aloft Downtown Detroit is located in the heart of it all. It is steps away from where the Detroit Tigers and Detroit Lions play. It is a short walk to LCA (brand new arena) for Red Wings games and the biggest concerts/tours out there. The Q-Line (Detroit’s newest public transportation) has a stop right outside the entrance. This can take you all the way down to the GM Renaissance Center. You can also ride it up to Midtown to check out Shinola for a nice watch & HopCat around the corner for some world famous crack fries. The cost is only $1.50 for a 3 hour pass. There are also two casinos within walking distance, Greektown Casino & MGM Grand Detroit. The third casino, Motor City Casino, is a little further and an Uber would be best. Detroit Opera House and Gem Theater are also very close by. You can catch a show at The Filmore, Fox Theater or just hang out in Greektown. After hitting up the Eastern Market on the way downtown (a must when visiting Detroit) and having New York quality pizza at Supino Pizzeria we headed over to the hotel to check in. We decided to Valet for $30 for the night. The public parking decks are gonna run you around $20 or more for the night so you might as well valet. When you walk in you are presented with one of the more beautiful lobbies you will see. A 4 story open area with a glass ceiling looking up at the rest of the building. It really is special. The desk is located at the end of the open area just in front of the elevators. There is a bar with a small menu to the right. There is also a small market where you can get free coffee and purchase other small snacks etc. at the desk. On the other side of the lobby is a vacant area that they are currently transforming into a new restaurant. Check in was quick and easy and I received an upgrade to a corner room because of my SPG gold status. Status which I received from my American Express Platinum card. I was offered 500 points or two free drink tickets as my amenity. I took the drinks – a much better value! We were on the third floor so we had a good look down into the lobby and the beautiful architecture on the way to our room. Once entering we had a very large hallyway which I guess is because it is an old building plus it was a corner room. Upon entering you notice that the wardrobe/closet is acting as a partition for the bedroom area. We had one king size bed that had a funky/modern headboard with some Detroit art integrated into it which I thought was a nice touch. We had a partial view of Comerica Park which would have been cool if the Tigers had a home game since we would have had an awesome view of the fireworks. The bathroom was located off to the right before you reached the wardrobe. The sink and mirror are located outside of the bathroom. The shower and toilet are located behind the just off the sink area. The actual shower and toilet area were kind of tight but they did what they could with the space they had. The hotel doesn’t have much of a on site restaurant offering. WXYZ Bar is located in the lobby, where we used our free drink amenity. It has a small menu with around 10 items on it. There are a few TVs, a pool table, and an outside seating area. It is mostly for grabbing a drink on your way out. There is also the small market for snacks etc. but that is about it. The new restaurant will be a nice addition when it is done but it isn’t really needed. There are so many restaurants within walking distance that you won’t want to hang out in the hotel anyways. The Aloft Downtown Detroit doesn’t have a ton in the way of amenities. There is a gym on site but I never made it there to take any pictures. You can see some here though. They also have quite a few meeting rooms but not much else for guests. Th Aloft Downtown Detroit is a beautiful hotel which is rated as the 3rd best hotel in Detroit on TripAdvisor. The architecture is amazing and the rooms are spacious and comfortable. The lobby is the real shining point of this hotel. For what it lacks in on site amenities and restaurants it makes up for with location. You are close to all the action in Detroit. Restaurants, sporting events, music/concerts, casinos, bars…the list goes on an on. Everything is within walking distance. I was also pleasantly surprised that they acknowledged my lowly Marriott Gold status and were willing to give me an upgrade based on it. The rooms were laid out well considering the age of the building. And even though the hotel is a few years old now it doesn’t show any signs of wear and tear. I look forward to staying again the next time we are downtown! A beautiful hotel with an amazing location in the middle of it all! Thanks for the review. Two minor things: “cieling” to ceiling and “The new restaurant will be a nice edition.” addition? I will make the changes – thanks! Also, how hard would it be to get from here to the Henry Ford? Greektown has a lot of good food and it gets pretty busy at night. Plus there is a casino right there so something is always going on. Heading there for a wedding at the end of the month, so timely review, thanks. Hotel is completely sold out (a Volleyball tourney going on), so likely not going to get an upgrade, but looking forward nonetheless. Welcome drinks all the way (unless traveling by myself)! Awesome – you will enjoy it! Should be a great spot for a wedding too.